I always hear this lesser-of-two-evils subtext when asked at the checkout line if I prefer paper or plastic bags to carry home my groceries. And yet, it's not even a whisper when I admire a pretty package of pastries, knowing that the box will soon be crumpled in the bin, or accept my restaurant leftovers in yet another plastic container to add to the dozens already clogging my cupboards. Then, there are the sandwich baggies, cling wrap and aluminum foil ever present in my kitchen, awaiting their duty to wrap around food and keep it (relatively) fresh until later. When it comes to choosing materials for toting and storing my food, I confess that convenience often trumps conscience. Modern technology has made it possible to reconcile the two (and provide a sop to my guilt) with 'green' packaging made from natural renewable sources like corn and potato starches and plant fibers. Still, they must undergo energy-consuming processes in order to reach a usable form and some bioplastics are not necessarily biodegradable. It would seem there really is no such thing as a free lunch - even one that's been packed in a soy-based container. But what if, instead of looking forward to scientific future, we look back at practical past to see what was used before manufactured packaging became the norm and still has utility today? Here in the Philippines, a lack of appropriate pulp sources makes paper products expensive while an abundance of discarded synthetic materials contributes to enormous landfills and constantly clogged sewers in urban areas. As alternatives, I've encountered all-natural packaging that require nothing more than access to local trees, a bit of hand crafting and the occasional machete. First, bow down to the coconut palm (Cocos nucifera), also known as the Tree of Life for the many practical uses of its different parts. 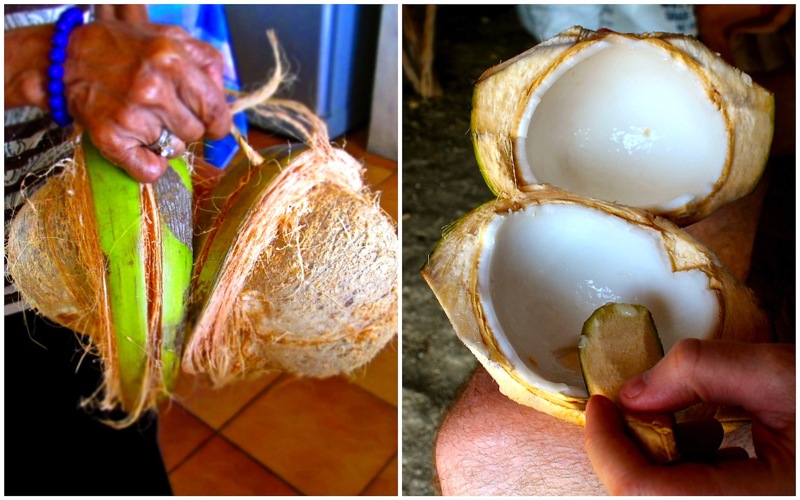 Buko, or young coconut seed, is particularly multipurpose - it can provide its own handles for carrying and is a beverage, food and utensil all in one. During a recent visit to the Batanes Islands, the Philippines' northernmost province, Mr. Noodle and I enjoyed a post-hike refreshment of coconut water straight from the shell. After the final sip, the stall owner deftly wielded a large knife to chop the empty husk in half, slice off a piece to fashion a crude spoon and hand it back so that we could eat the gelatinous coconut meat inside. And when that was done, the remains were collected so that the hairy husk could be turned into a sturdy fiber called coir and the dried shell transformed into charcoal. The leaves of other palm species are equally useful for food-related purposes. 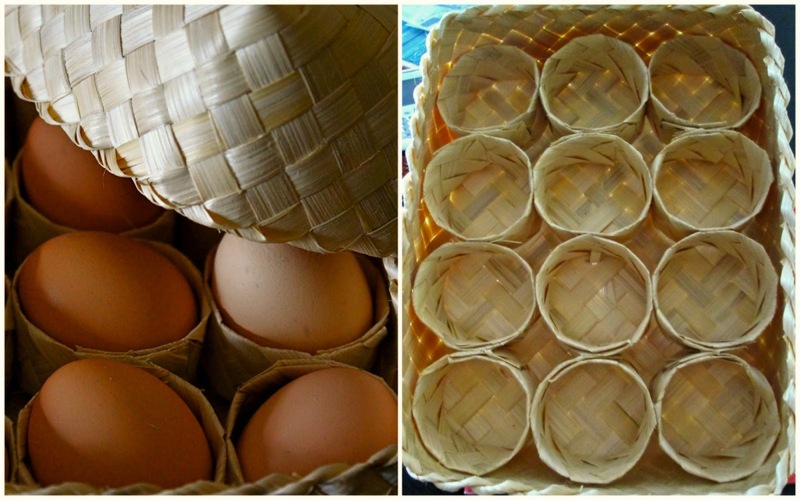 Buri (Corypha elata) is used to make baskets and sturdy bayong, the traditional bag for palengke (wet market) shopping, while nipa (Nypa fruticans) makes lovely woven containers, such as clever lidded boxes that make it cool to give a dozen eggs as a gift. Leaves are used not only to hold food, but to cook them as well. 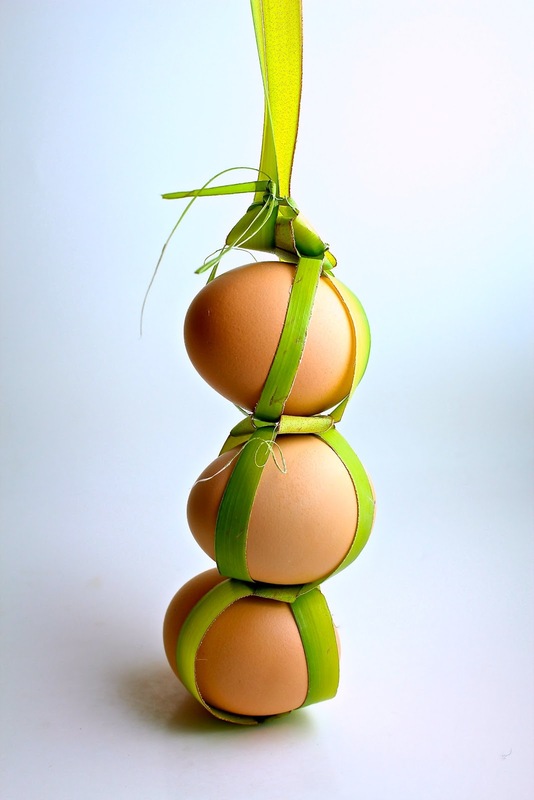 Puso or pusu is a hanging rice pouch from Cebu, woven from young coconut leaves, filled with dry rice then cooked by boiling or steaming and served as is. Suman is the collective label for sweet rice delicacies that vary between provinces and municipalities by local names, ingredients and preparation. 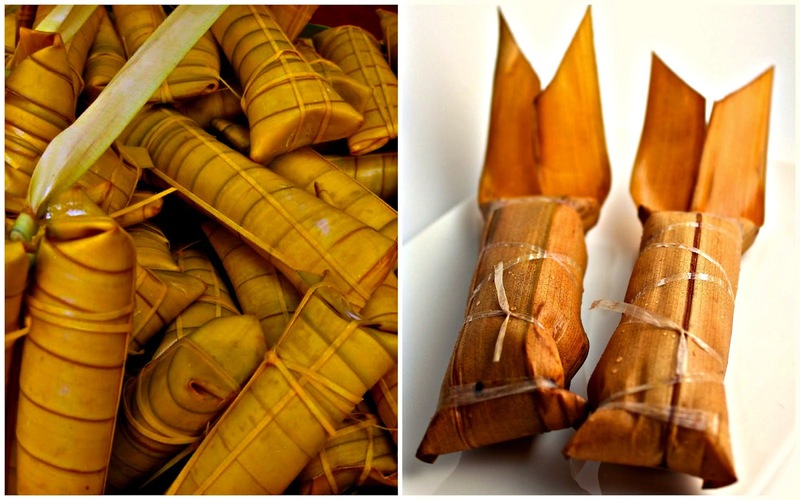 While most suman are made with malagkit (sticky rice), some use cassava (sumang kamoteng kahoy) or millet (budbud), and may either be steamed, grilled (tupig) or boiled in molasses or sugarcane juice (patupat). 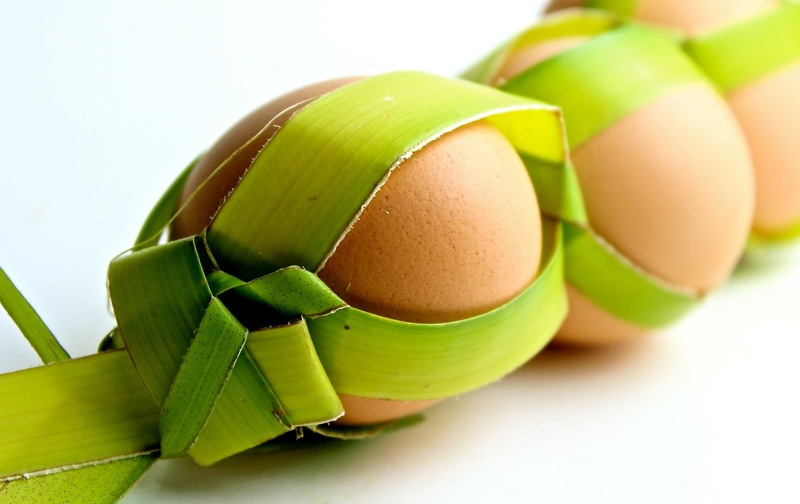 But they all have one thing in common: they are wrapped in leaves, such as coconut, buri, nipa and banana. 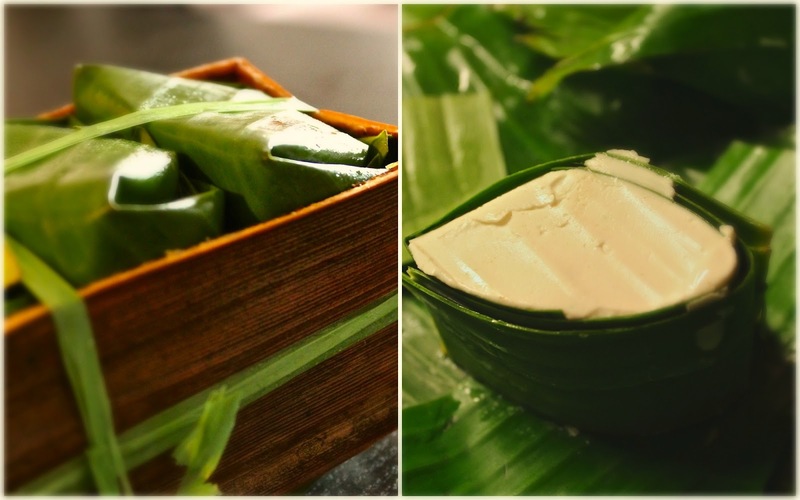 Abundant and sturdy, banana leaves are culinary all-stars used to bake or steam fish, to line pans for making rice cakes such as puto and bibingka, to wrap inihaw (barbecue) to go, and as an all-purpose table setting in place of serving platters and dinner plates. They are also the packaging of choice for kesong puti (literally 'white cheese'), a native soft cheese made from carabao (water buffalo) milk. There are even more examples of natural materials not only in food packaging, but also for building materials and practical household goods. The list of eco-conscious everyday items grows even longer when you include those made from recycled and repurposed materials, but I'll save them for another post. 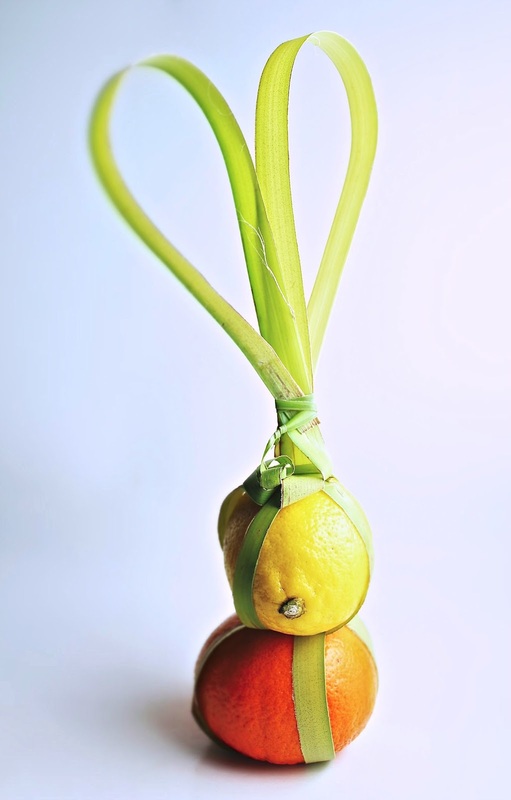 In the meantime, I tried my hand at making a very easy coconut leaf project that would make pretty presentations for otherwise humble foodstuff. 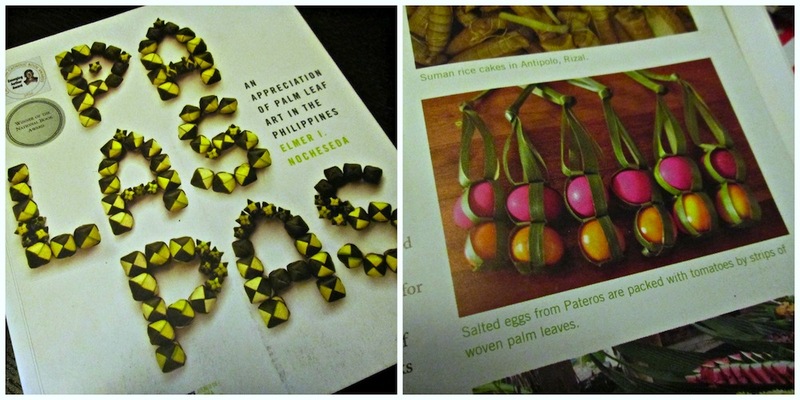 I made up the name because I have yet to learn the proper term for the coconut leaf packaging pictured in Elmer I. Nocheseda's book, Palaspas: An Appreciation of Palm Leaf Art in the Philippines, a detailed record of folk artistry disguised as practical skill. 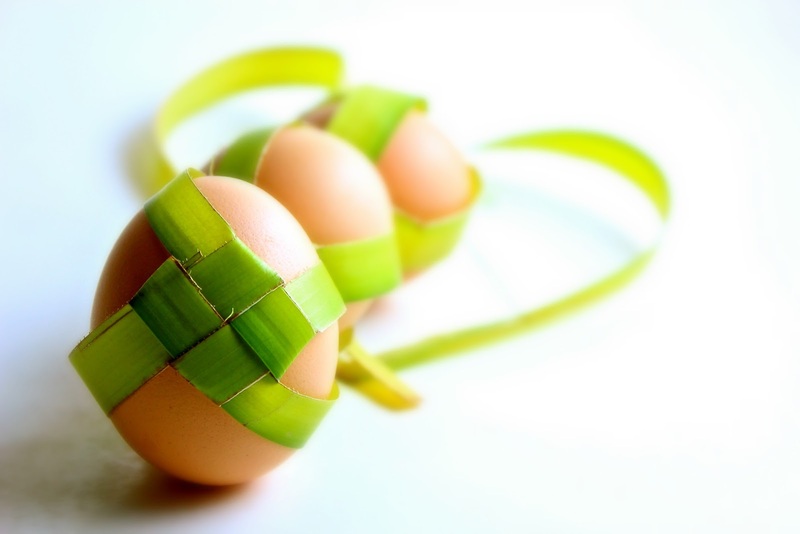 Although he did not label the particular packing of eggs and tomatoes, Nocheseda provides detailed instructions and photographs for more than 70 kinds of palaspas, including kiliyakay, or pinwheel, which he explained is a basefold for baskets. Looking at the unnamed egg holder, the pinwheel seemed to be the likeliest starting point. My kiliyakay karrier is a visual interpretation of the one depicted in Nocheseda's book and expands on his instructions for a basic pinwheel design (p. 150). It can be used to carry a variety of small items, like eggs and fruit. Use your imagination! 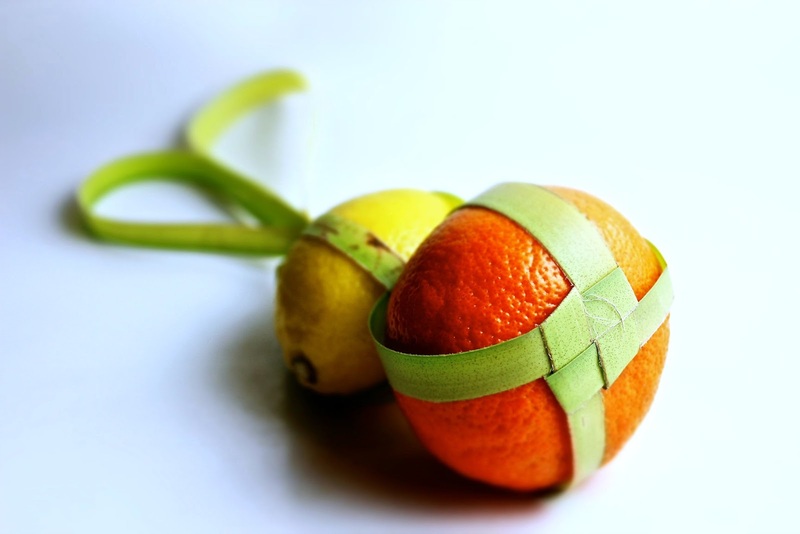 Click here for instructions on How to Make a Kiliyakay Karrier. *waves a long overdue hello* Guess those are what you'd call sustainable containables, TN! And so pretty too. Needless to remark, there aren't too many coconut or banana leaves in my neck of the woods, and though I can get compostable bags made (yes!) from potatoes, I do wonder about their true cost in terms of what it takes to make 'em (not to mention the fact that they do, of course, cost more to buy). Ay me. Yet more noodles to untangle, I see. Wow - these are very cool! I also love the egg crates above. Very resourceful! I feel so guilty everytime I toss something in the trash, but in the world of convenience it's hard to stop, unfortunately. I love seeing these different options.